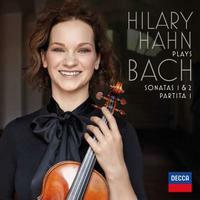 Hilary Hahn released her first album, Hilary Hahn Plays Bach, when she was 17 to critical and popular success. Now 38, she completes her recording of the Bach sonatas and partitas for solo violin with an album featuring the first partita and first and second sonatas. A three-time Grammy Award-winner, Hahn has released 12 albums on the DG label, five on Sony, and numerous other projects, including an Oscar-nominated movie soundtrack. Now available on vinyl, this is Hahn's first album on Decca.